MENTOR's New M-Fibre Catalogue is now available - download a PDF version here. As one of the leading specialists in integrated LED product lighting, MENTOR has extended its customised light solutions technology with the addition of M-Fibre, a new side-light fibre system. M-Fibre offers fascinating possibilities for functional and decorative “line lighting” in many different market sectors. MENTOR’s M-Fibre is a system of customised LED modules and a special side-light fibre, tailored to the specific requirements of the customer application. PMMA plastic optical fibres (POFs) of the correct length to suit the application are activated ie provided with individual light-dispersing surface structures. They are then bundled together to create a fibre core and sheathed with a diffusing sleeve. 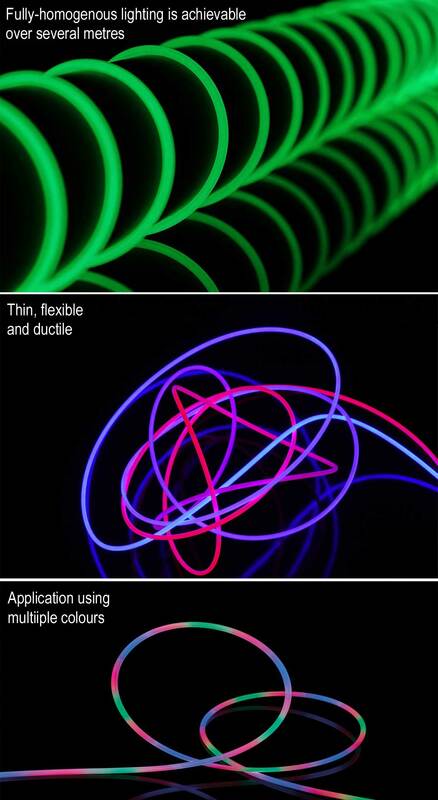 The resulting side-light fibres are very thin and flexible, providing fully homogenous light with a radiation angle of 360°, without visible colour deviations even in tight radii. Depending on the application, the fibres can be activated across the entire length or only partially. With partial activation, only specific areas of the side-light fibre are lit up in a targeted and loss-optimised manner. This prevents undesired scattered light and optimises the efficiency of the integrated lighting system. With this technology, multi-coloured applications and “running” lights or similar dynamic lighting scenarios are also possible. Using single or multi-coloured LED modules for one or two-sided lighting, M-Fibre provides lighting solutions optimised to the space available in the product application. The physical flexibility of M-Fibre allows complex contours to be followed over a length of several metres. Unlike other POF solutions on the market, M-Fibre is not available in rolls or as a standard solution – it is a lighting system in which the individual components are optimally tailored to particular customer requirements. In addition to the system’s high physical flexibility and outstanding light quality, other advantages of the new, largely tool-free technology are the low initial costs and short development times. MENTOR's M-Fibre side light fibre offers product designers and developers many options for functional yet decorative linear lighting or indirect ambient lighting. Integration into freeform surfaces is also easily achievable. Through the spatial separation of the light source and the light emitting surface, M-Fibre can also be used under water, in explosion protection areas and in the food industry. The applications for high-quality, product-integrated light of this kind are enormous – for example the automotive, wearables and mechanical engineering sectors. Building services engineering, furniture, domestic appliances and safety technology are just a few more examples of the possibilities.